This medication is used to treat certain eye conditions due to inflammation or injury. Dexamethasone works by relieving symptoms such as swelling, redness, and itching. It belongs to a class of drugs known as corticosteroids. This medication may also be used to treat swelling, redness, and itching of the outer ear due to inflammatory conditions. EYE: Unless otherwise directed by your doctor, do not wear contact lenses while you are using this medicine. Sterilize contact lenses according to the manufacturer's directions, and check with your doctor before you begin using them again. To apply eye drops, wash your hands first. If you are using a suspension form of this medication, shake the bottle well before using. To avoid contamination, do not touch the dropper tip or let it touch your eye or any other surface. EAR: Clean and dry the ear canal before using this medication. To make sure the right amount of medication is given, and to avoid touching the ear with the dropper, have another person insert the drops if possible. To lower the risk of dizziness, hold the container in your hand for a few minutes in order to warm it. To apply ear drops, wash your hands first. To avoid contamination, do not touch the dropper tip or let it touch your ear or any other surface. If you are using a suspension form of this medication, shake the bottle well before using. Lie on your side or tilt the affected ear upward. Hold the dropper directly over the ear and place the prescribed number of drops into the ear canal. To help the drops roll into the ear of an adult, hold the earlobe up and back. For children, hold the earlobe down and back. Keep the head tilted for 5 minutes, or insert a soft cotton plug if so directed. Alternatively, your doctor may instruct you to place a cotton/gauze plug in the ear canal, moisten it with the medication, and leave it in the ear for 12 to 24 hours or as directed. The plug should be replaced at least once a day. Repeat these steps for the other ear if so directed. Apply as often as directed by your doctor. Do not rinse the dropper. Replace the dropper cap after each use. Do not use this product if it becomes contaminated (for example, drops turn a dark color). Use of contaminated eye medication can cause infection, serious damage to the eye, and loss of vision. Use of contaminated ear medication can cause infection, serious damage to the ear, and hearing loss. Contact your doctor or pharmacist for more information. What conditions does Maxidex Suspension, Drops (Final Dose Form) treat? Rarely, stinging/burning of the eyes for 1 to 2 minutes may occur when you apply this medication. If used in the ear, stinging/burning may also rarely occur. If any of these effects persist or worsen, tell your doctor or pharmacist promptly. This medication may mask the signs of an eye/ear infection. It may also put you at greater risk of developing an eye/ear infection, especially with prolonged use. Report any new or worsening symptoms such as eye/ear discharge/swelling/redness, vision/hearing problems, or no improvement of your current eye/ear condition. Your doctor will need to adjust your treatment. List Maxidex Suspension, Drops (Final Dose Form) side effects by likelihood and severity. Before using dexamethasone, tell your doctor or pharmacist if you are allergic to it; or if you have any other allergies. This product may contain inactive ingredients (such as sulfites found in some brands), which can cause allergic reactions or other problems. Talk to your pharmacist for more details. Before using this medication, tell your doctor or pharmacist your medical history, especially of: eye infections, recent eye surgery, cataracts, glaucoma (open-angle type), severe nearsightedness (myopia), diabetes, other ear problems (such as a hole in your eardrum, ear infections). After you apply this drug in the eyes, your vision may become temporarily unstable. Do not drive, use machinery, or do any activity that requires clear vision until you are sure you can perform such activities safely. If you develop a new eye infection or injury, or require eye surgery, ask your doctor if you should continue to use your current bottle of dexamethasone eye drops or start a new bottle. What should I know regarding pregnancy, nursing and administering Maxidex Suspension, Drops (Final Dose Form) to children or the elderly? Laboratory and/or medical tests (such as eye exams, measurement of the pressure inside the eyes, ear exams) may be performed periodically to monitor your progress or check for side effects. Consult your doctor for more details. Different brands of this medication have differentstorage needs. Check the product package for instructions on how to store your brand, or ask your pharmacist. Keep the bottle upright and tightly closed when not in use. Do not store in the bathroom. Keep all medicines away from children and pets. Are you taking Maxidex Suspension, Drops (Final Dose Form)? Are you considering switching to Maxidex Suspension, Drops (Final Dose Form)? 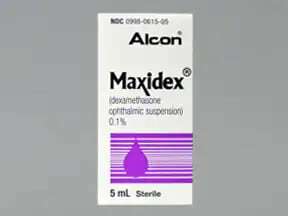 How long have you been taking Maxidex Suspension, Drops (Final Dose Form)?